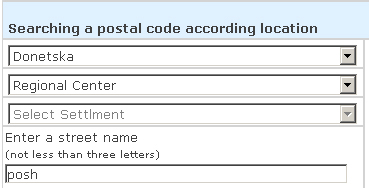 Searching for the postal code by street name is available for all cities and towns! To perform this search it is necessary to choose the region (oblast), then you should choose ""Regional Centre"" in the drop down list ""Select the Region"". The text box ""Enter the street name"" will become available. For quick search you should enter first 3-4 letters of the street name, without entering the type of the street (avenue, lane etc). For example, if you need to find the postal code of Poshtova street in Donetsk city, you should use the following parameters. For all other settlements it is enough to choose only the name of the settlement. До уваги споживачів ДОНЕЦЬКОЇ та ЛУГАНСЬКОЇ областей!